Glimpse from the Peace event at Fairfield House last week. This is the moment of the planting of the Peace Lily. The first dig was made by Ras Bandele Selassie, as the Priest of the area. The planting was done Ras Chris Leigh, as the Farmer of the grounds. After the planting, the people scattered (uncooked!) rice grains as a symbol of collective witness. 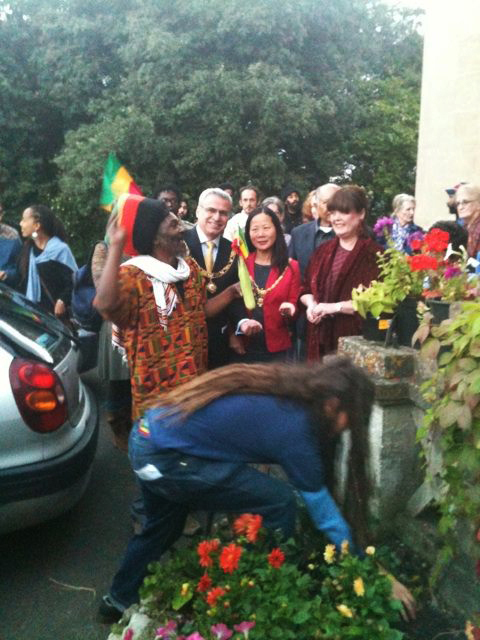 Watched on here by the Lord Mayor and Lady Mayoress of Bath, and Lizzie Davies from the Global Circle of Peace. Photograph taken by Councillor Paul Crossley, the Head of Bath & North East Somerset Council. A great event.